Pops conductor John Morris Russell thanks Edyth Lindner and her family for their continued support of Music Hall. 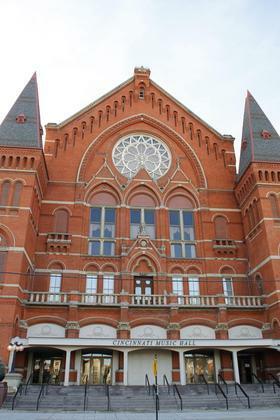 On May 1, 1877, construction began on Cincinnati’s Music Hall. 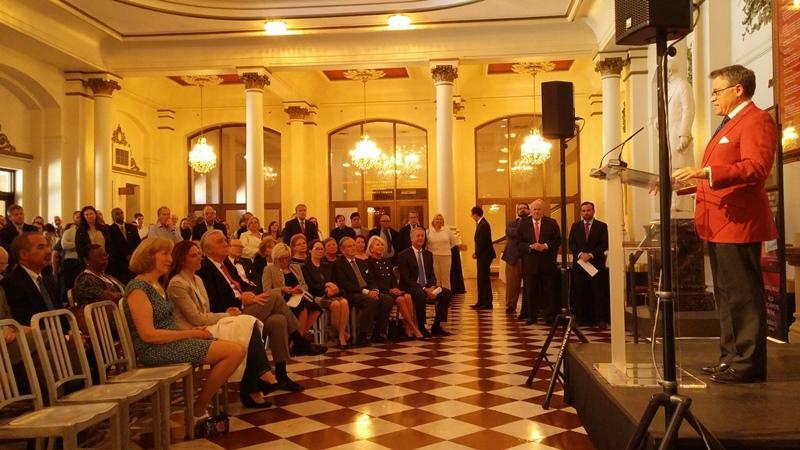 Now, 138 years later, the effort to renovate and restore the landmark received a large gift. Edyth Lindner and the American Financial Group have pledged $10 million toward the estimated $125 million price tag. The donation from Lindner and American Financial puts the fundraising effort within $10 million of the goal, according to Steve Leeper, president of 3CDC, a partner in the project. Otto Budig, president of the Music Hall Revitalization Company, (and Cincinnati Public Radio board member,) says the building has not had “significant” renovations in over 40 years. “During this period, MHRC has remained fully committed to restoring Music Hall,” Budig says. “And working in concert with 3CDC and the Cultural Facilities Task Force, and the city of Cincinnati, we are raising the funds needed. “To celebrate this significant gift, our beautiful foyer will be named in honor of Edyth B. Lindner,” Budig says. There have been other large donations. Leeper says there have been 20 gifts of $1 million or more. The donation from Lindner and American Financial, Leeper says, puts the fundraising effort within $10 million of the goal. Pops conductor John Morris Russell calls Music Hall the “epicenter of cultural life in Cincinnati. “But this great edifice is also in dire need of attention,” he says. The National Historic Trust for Historic Preservation named Music Hall as one of America's 11 most endangered buildings. Work continues to complete the funding puzzle to renovate Cincinnati's Music Hall. 3CDC is helping with the project. President Steve Leeper spoke to city council's Economic Growth and Infrastructure Committee Tuesday. The plan has a price tag of $123 million and right now there is about a $20 million hole.